How do I know when to call Iowa River Hospice? Individuals who have a life-limiting illness and/or are choosing comfort care over aggressive treatment can obtain assistance. It is never too soon to discuss all available options – including hospice care. End-of-life care decisions are difficult to discuss and it is helpful to have conversations prior to a major concern. Guidance is available if you or someone you love is experiencing increased health problems, the need for more care, or has had frequent hospitalizations or emergency visits. Iowa River Hospice is available to respond to your needs. Call 641-753-7704 or 800-827-4521 to visit with our professional staff. Iowa River Hospice can assist anyone – family, friends, clergy, healthcare professionals – and offer guidance with end-of-life care needs. If you or someone you love is experiencing increased health problems, the need for more care, or frequent hospitalizations or emergency visits and need some guidance, please call or visit. We have staff available to respond to your needs. Anyone can make a referral for hospice care, including patients themselves. However, all admissions to the hospice program requires a physician's approval. Medicare guidelines must be met for admission to a Medicare certified hospice. Does choosing Hospice mean I am giving up hope? HOPE changes when someone has an incurable illness. But there is always HOPE. HOPE for a cure may change to HOPE for comfort. It may also change to HOPE for memorable moments with those we love; HOPE for achieving reconciliation and closure; HOPE for respect and dignity or HOPE for a special someone or something. Iowa River Hospice is committed to nurturing HOPE. Hospice does care for cancer patients but also those with any life-limiting illness as treatment changes from curative to comfort. Some examples are heart or lung disease, kidney failure, ALS, dementia, stroke or a combination of illnesses with only comfort as an option for care. How is the cost of hospice covered? Iowa River Hospice, as a “community hospice,” also receives financial support from the community, Marshalltown Area United Way, South Tama County United Way and some fundraisers. Yes, absolutely. You will also have the additional benefit of the hospice medical director and the interdisciplinary team working in partnership with your physician. You may see your physician as often as you would like and your primary hospice nurse can accompany you if you desire. Can I make my own decisions about the amount and choice of cares received if I am in the hospice program? Yes. You will direct the care you receive. Iowa River Hospice will explain your treatment and care options. It is then your decision to determine what works best for you. We know that no one understands what you’re going through better than you do. We respect and honor our patient’s choices. Can I leave my home for social activities if I am in the hospice program? Yes, in fact we encourage you to go out as often as you feel able. Living is encouraged! Hospice care can be provided in your own home, a nursing facility, assisted living facility, the hospital or in the Hospice Home at 502 Plaza Heights Road. Iowa River Hospice has contracts with all nursing and assisted living facilities in the areas we serve. Professional and compassionate care is provided to all our patients, regardless of where the services are located. 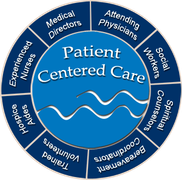 What are the benefits of care given by Iowa River Hospice? Established in 1983, Iowa River Hospice is the most experienced hospice in Marshall, Tama, southern Hardin & Grundy counties. Our professionals are experts in pain and symptom management. Expert guidance is available at all times by a specialty trained hospice pharmacist, your personal physician and the hospice medical director. Iowa River Hospice staff is accessible at any time 24 hour/day, 7 days/week. You are not alone. Our large base of dedicated community volunteers provide additional support and assistance to our patients and their families. Our main concern is YOU and helping you live your way! Is support offered to caregivers? Hospice attempts to care for the family as much as the patient. The diagnosis of a terminal illness affects the entire family and all who are close to the patient. The caregiver(s) are subject to physical, emotional, social and spiritual needs also. An Iowa River Hospice social worker, chaplain and entire interdisciplinary team assist with helping to support and comfort the caregiver. There is also a caregiver support group available if desired. Is bereavement or grief support offered by Iowa River Hospice? Iowa River Hospice offers bereavement support to all whose loved ones have been cared for by our hospice or any member of our communities in need of this support. Services include personal visits, phone contacts, cards, newsletters and support groups. These services are free of charge. Is there support for children? Yes, Iowa River Hospice offers support for children who have suffered a loss. Can I visit with someone about my sadness and loss? Yes, just call the Iowa River Hospice office at 641-753-7704. We have bereavement coordinators available to visit with you, offer support and provide guidance. If you still have questions or would like more information click here to Contact Us.